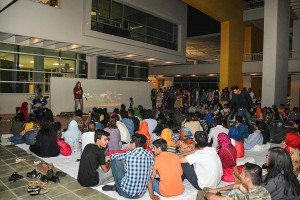 Habib University’s Center for Media and Design, in collaboration with the Consulate General of the Federal Republic of Germany held a tribute to the city of Karachi within its campus walls on 6th November, 2015. 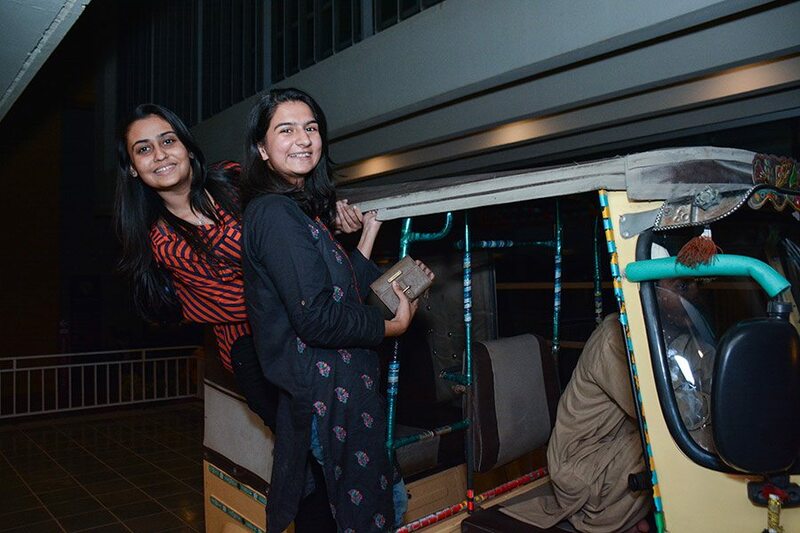 The event, as arranged by the University as well as the German Consulate, celebrated the culture and life of Karachi, everything from its vibrant street art, to poetry and film, dance and the general air represented. To capture the forever active and fast-paced life of Karachi, the event was spread out in different areas of the campus, holding a variety of events at the same time. The ambience of “Karachiscape” was a perfect representation of the city, from its lights, beauty, boldness and dark glamor. The event was open to public, and drew large crowds of young and old as the evening wore on. The fusion of art, music, dance and performance was well-represented, allowing students and the general public alike a chance to witness and experience each, in all its glory. 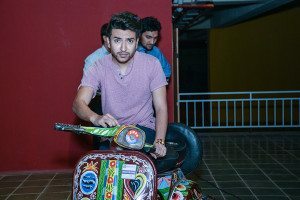 As soon as one entered the campus’s “Central Street”, they were welcomed by an ongoing exhibition of Karachi through a photographic form of expression. The Central Street featured several different stalls, where a mesh of delicious sights and sounds, and smells wafted into the air. The area held everything, from enthusiastic palmists waiting to read the fortunes of the young, to ice-cream, gol gappay and chaat stalls, to kitschy, colorful jewelry and trinket stalls. The “sounds” of Karachi were provided by loud-speakers blaring the general sounds of Karachi, from bus-walah’s to blaring horns of crowded roads, giving off a distinctive feel for Karachi life. An ongoing exhibition of photographs were also strategically placed on the Central Street, done by various students and curated by their instructors. The evening began with “Welcome” speeches by the faculty of Habib, namely Dr. Markus Heidingsfelder and Ms. Saba Imtiaz, along with the gracious Mr. Rainer Schmidchen, Consul General of Germany. 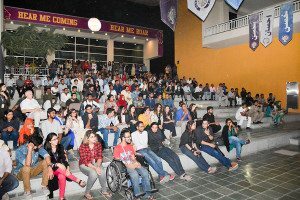 To represent the Film students of the Centre of Media and Design, there was also a drive-by silent documentary “Reading Karachi” by Dr. Heidinsfelder, Assistant Professor of Media Studies at Habib University. The celebrated author Ms. Saba Imtiaz also recited a piece she had written about Karachi, touching upon the beauty and landscape of Karachi. “Everyone likes to say that Karachi and Karachiites are resilient, but this is a lie. We do not merely live in Karachi, Karachi lives in us. We moan about it, but we also find the ability to defend it”, she exclaimed. 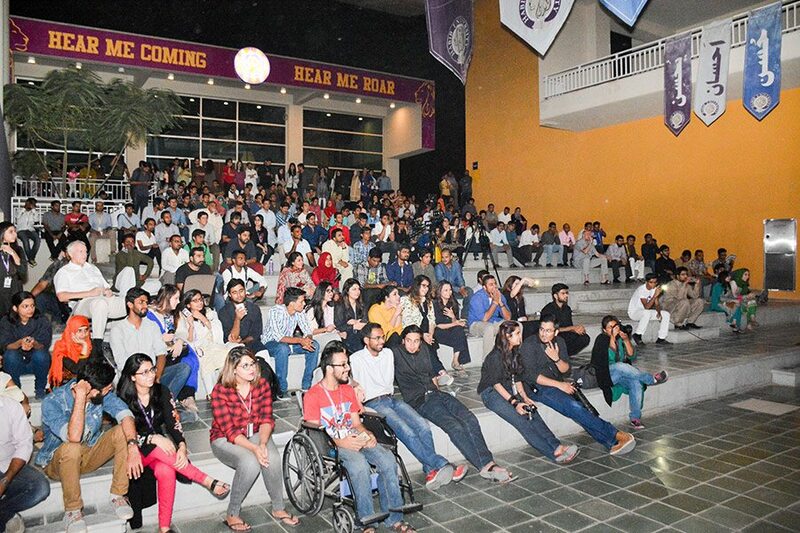 The latter half of the evening held a screening for another documentary by Habib University student, Ali Rizvi. 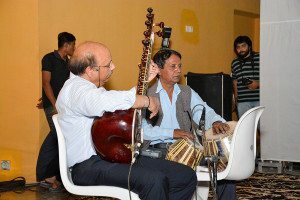 His documentary, titled “The Soul of Karachi”, was screened with a live soundtrack by celebrated Pakistani musicians, Nafees Ahmed Khan and Ustad Bashir Khan, who provided the dulcet tones of tabla and sitar to narrate the video. One of the most popular parts of the Karachiscape experience was the dance performance by Lyari dance troupe “We are one”. 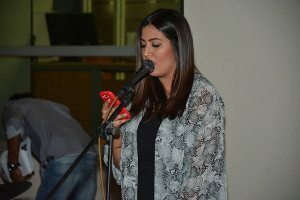 Live slam poetry sessions were held alongside all of these events, as a mesh of students detailed in flowery detail their experience of the city of lights. 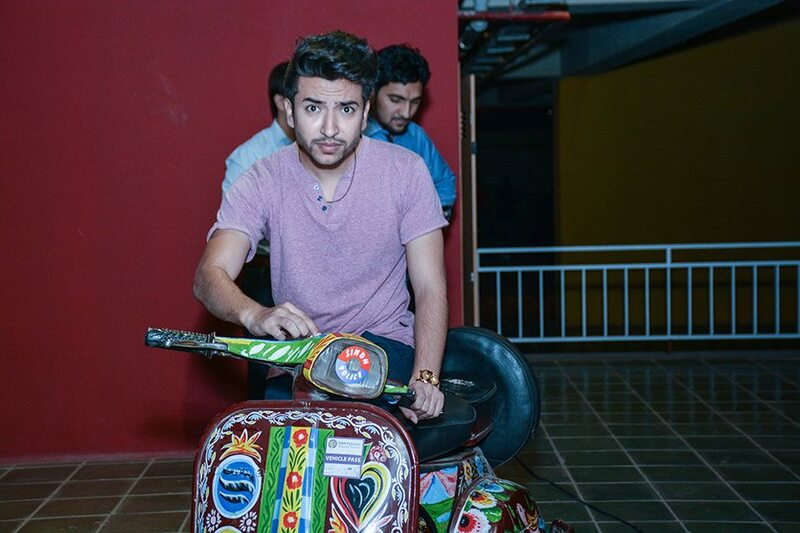 The aesthetics of the event were designed by Karachi-based artist “Sajjad Ahmed”, who made sure to incorporate one of the icons of the city – the “dulhan” bus. 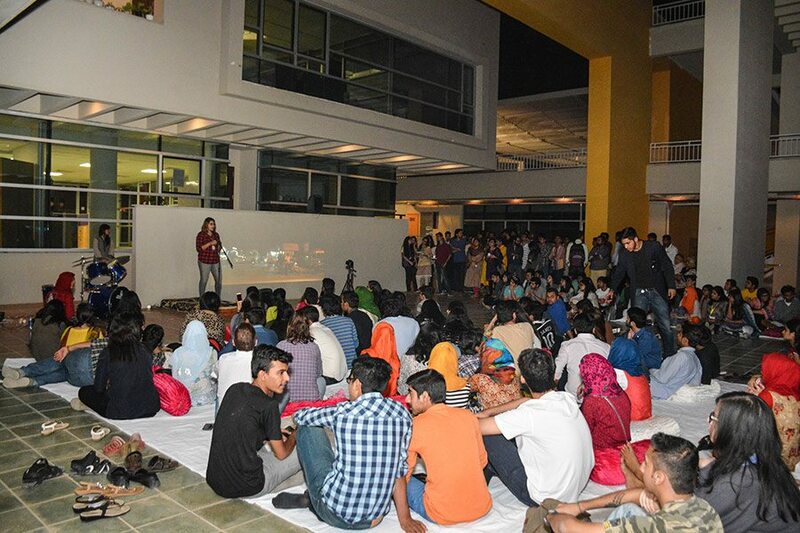 Each aspect of the event was bursting with energy, and a steady hum of Karachi sounds and the thrum of a happy public space ensured the event was a hit. 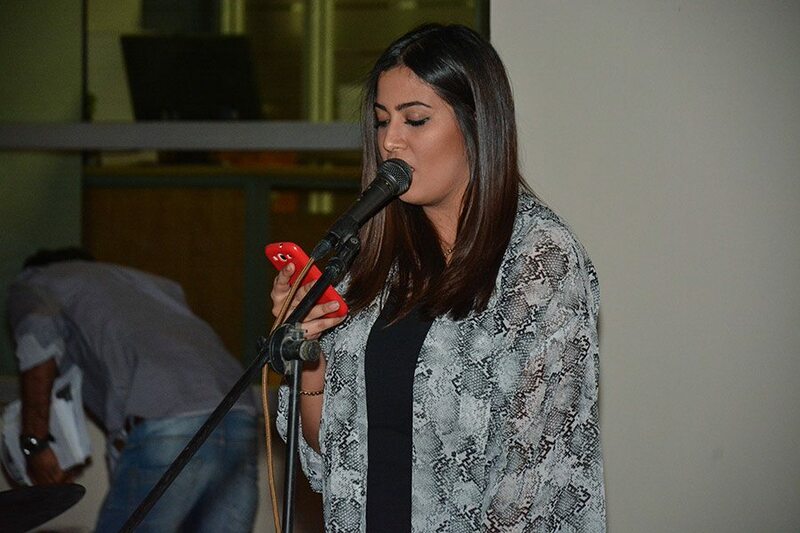 Habib University – KarachiScape coverage from Habib University on Vimeo.